Although the United States is often viewed as having some of the best healthcare in the world, the validity of this assertion has been called into question for a number of years. A 2009 analysis from the Urban Institute found that the quality of healthcare in America at that time was a bit of a “mixed bag”—faring relatively well in areas such as cancer care, but lagging in mortality rates from treatable and preventable diseases. A 2014 report from the Commonwealth Fund revealed continued trends that were along the same lines—despite the implementation of the Affordable Care Act (ACA) in the interim. In the report, the US “ranked last overall among 11 industrialized countries on measures of health system quality, efficiency, access to care, equity and healthy lives.” Significantly, the US was noted to have the highest costs while also displaying the lowest performance. 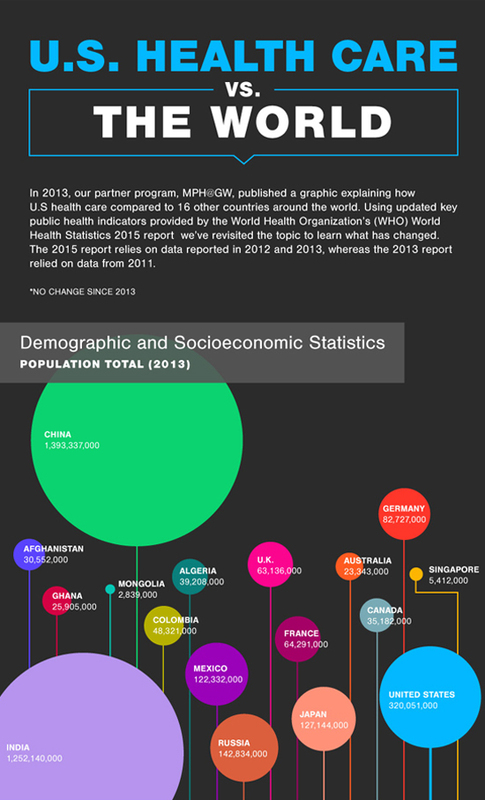 To explore these issues further, MHA@GW—the online Executive Master of Health Administration program at George Washington University—produced an infographic comparing US healthcare to 16 other Organization for Economic Co-operation and Development (OECD) nations. The following provides an overview of factors that affect the quality of healthcare in the US and a comparison of how other countries spend their healthcare dollars. Around the world, factors that impact the quality of healthcare include not only health service availability, but also usage rates. To quantify these indicators, the infographic employs immunization coverage rates for 1-year-old children. The highest ranked country was China, and the US came in a distant 12th among the nations listed. To reflect risk factors, the graphic compares the use of improved drinking water sources across the countries listed. In this category, the US was number 8—at the 99th percentile—with the 7 nations in the lead all reporting that 100% of their populations were using improved sources. Adequate health system infrastructure is a key factor that impacts healthcare quality. To quantify it, the density of the physician workforce is measured in an aggregation of data from 2007 to 2013. In this category, Germany ranked highest—with 38.9 physicians per 10,000 individuals in the population. Meanwhile, the US ranked sixth, with 24.5 physicians per 10,000. In comparison to the OECD average of 3.2 practicing physicians per 1000 people, the US has 2.5—as well as a lower relative number of hospital beds. With such less-than-stellar rankings, one may expect per person healthcare spending in the US to be partly to blame. However, the US has the highest healthcare costs in the world—spending 54% more on healthcare per person than most developed nations across the globe. Other countries are doing better within the context of life expectancy and mortality rates, and Singapore is the big winner here. The same eight countries occupy the top eight spots in both per person spending and life expectancy rates. However, Singapore ranks eighth in spending, and second in life expectancy. Overall, healthcare spending in the US is reportedly on the decline—however, CMS expects it to increase heading toward 2024. Whether or not this holds true, the key for improving healthcare in our country must include an upward trend in the quality of care, as well.